In Antiquity, the art of memory was a mnemonic device that allowed an orator, such as Cicero, to recall all the points he wished to make by associating each of them with an image or architectural element in the site he was speaking. When this art was rediscovered in the Renaissance, hermetic thinkers like Giordano Bruno reworked it into a method that allowed them to acquire knowledge with the creation of “memory palaces.” The elements of these memory palaces were not intended to trigger the memory but would actually transform into talismanic objects with knowledge entirely new to the seeker. 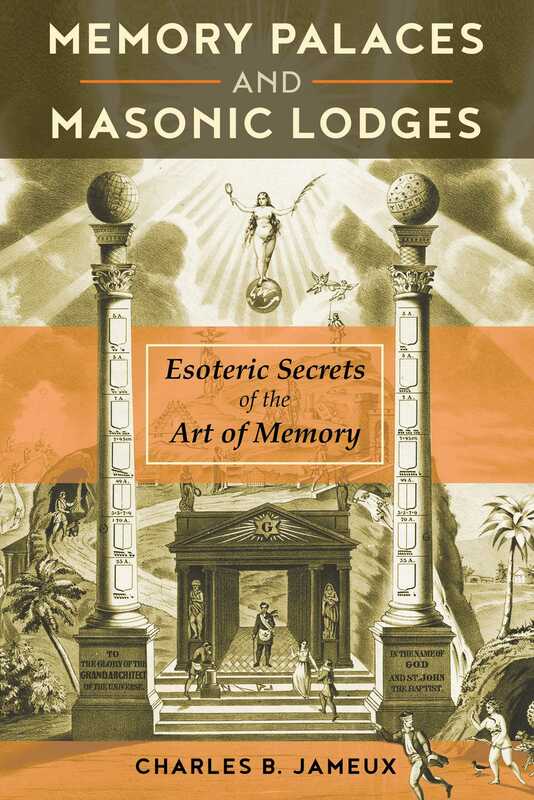 In this book, Charles B. Jameux shows that this hermetic reworking of the classical art of memory was no mystery to operative Masons, who grafted it onto their own rituals, catalyzing the transformation of operative Masonry into speculative Masonry. He shows how the hieroglyphic writing used during the Renaissance in the art of memory provided the groundwork for one of the most esoteric elements of masonic practice: the grasp of the realm of image by the letter, where symbols were “buried” within words. Using archival evidence from 17th-century Scotland and earlier, combined with the research of modern scholars such as Frances Yates and David Stevenson, Jameux argues that the creation of speculative Freemasonry can be traced back 100 years earlier than conventional history records--to 1637, when the first recorded use of the Mason’s Word appeared and with it, the first known appearance of the symbolic Temple of Solomon. He follows Giordano Bruno’s visit to the British Isles in the late 16th century and the subsequent activities of the men he met there, showing that Masonic symbolism owes much of its current form to early memory palaces, which represented the Masonic lodge and temple in their fully imaginary states. Revealing the pivotal role of the memory palace and hermetic traditions in early Masonic symbolism, Jameux sheds new light on the Masonic questions asked of each initiate and the spiritual importance of the Temple of Jerusalem to Freemasonry. In the seventeenth century, the extraordinary mnemonic technique, “the art of memory,” which straddles both analogical thinking and conceptual thought, did not enjoy quite the popularity and efflorescence it had, paradoxically, among those who know how to read and write in Antiquity, as well as during the Middle Ages and the Renaissance. During the Latin influenced Middle Ages, it often continued to serve as an aid for making speeches, but under the pressure of the finest minds and greatest figures of the time, it was naturally integrated into the Christian doctrine and its cardinal virtues. After Charlemagne, we find the prestigious names of Albertus Magnus and Saint Thomas associated with it while the Dominican Order was spreading a domesticated use of it for the purposes of apologetics, conversion, and inquisition. Peter of Ravenna promoted a secular adaptation of this memory technique. The intellectual and spiritual situation of the art of memory evolved again during the seventeenth century. On the one hand, the importance of the art in accordance with Ramon Llull’s definition began to dwindle: eventually all that remained of it with any potency was the search for THE method. At this same time the upholders of the magical, hermetic notion of this art had taken possession of the forefront of the stage of ideas--in any case at least since the “revelation” of the writings of Hermes Trismegistus by Isaac Casaubon in 1614. On the other hand, the art was associated with different modes of representing things and ideas, primarily in the development at this time of emblemata. These continue to be very poorly understood today despite the publication of André Alciat’s seminal book in Augsburg in 1531. Seeing the fantastic proliferation of the written and printed word to the detriment of the speech memorized by heart and the oral tradition, the Western man of 1700 could have said to himself like Victor Hugo: “This will kill that.” Wouldn’t it therefore be likely that under these conditions the still forming Masonic symbolism would become the storage, preservation, and transmission site for a particular form of the art of memory? This was an essentially oral form that was in the midst of being dethroned and swept aside by writing. This is what the historical developments and transformations of the Art would seem to suggest, in part. Far from an elsewhere and nowhere of utopia according to Campanella, wouldn’t the future operative and non-operative Freemasons of 1600-era Scotland, engaged on an extra-professional quest for method but remaining immersed nevertheless in the here and now of spiritually conflictive societies, be in the process of discovering the Masonic symbol beneath the memorized image? If we accept the fact that Masonic symbols were created by their inventors as elements of language and communication intended to transmit moral and spiritual values capable of being made universal, just how did these inventors go about the task they set for themselves? Their first step was to select the terrain and the domain on and in which to situate their analogies and metaphors. This would be the domain of the builder in which the “graft” comes into play, because it naturally combines the master builder (the Great Architect of the Universe), the conceiver of the edifice (the architect), and the worker (the mason on the construction site) in its implementation. The ultimate aim implied by the practices on the field of activity selected this way is well known: in the image of the original Temple, the Temple of Solomon, intended to welcome the divine presence among human beings and fix it to one location (the Schekina). It would consist of building and constructing every edifice naturally capable of permitting the individual to be protected, to live, and to shelter his family, while at the same time building his own self. This spiritual building will thereby ensure the liaison and dialogue between the “little world” that this individual embodies, and the organized “large world” in which he dwells, aware of the favor and good fortune that the Great Organizer will arrange to be his lot in return for his labor, his irreproachable conduct, and his loyalty toward Duty.